The post-commencement reception provided a happy meeting for Brad Duhaime, a 1985 MCS major, and his old advisor, Professor Terry Morrison. 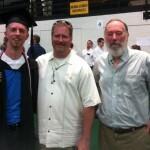 Duhaime was there to celebrate graduation of his son, Chris. Left to right: Chris Duhaime ’12, Brad Duhaime ’85, and Prof. Morrison. 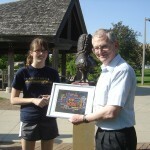 Senior Mathematics major Chloe Radcliffe has been chosen to deliver the 2012 commencement address. Read the official announcement for more information about Chloe and the 2012 Gustavus Adolphus Graduation ceremony.